This post is a break from the series reflecting on the early history of animals. It catches up on some cephalopods, where change has been afoot in the area of color. A few weeks ago I published a review in the journal Animal Behavior of a new book, Cephalopod Cognition, a collection of papers edited by Anne-Sophie Darmaillacq, Ludovic Dickel and Jennifer Mather. * It’s a good collection, but in the review I said I was surprised at some things that weren’t grappled with in the book. One of these is a long-standing puzzle, which was mentioned in passing but not treated as much of an issue. Octopuses (and some other cephalopods) sometimes achieve an uncannily good match between their skin color and the background, but physiological evidence strongly suggests that they are color-blind. Their eyes contain only one kind of photoreceptor, and color vision – it is thought – requires at least two. I’ve always found this pretty baffling. Below is a figure of two Sydney “gloomy” octopuses (O. tetricus) I included in the review to illustrate some close matches. The uncamouflaged appearance of this species is seen in the first photo above. Note that the right-hand octopus below has matched two different colors on the surfaces around it. Back in 2010, a paper by Lydia Mäthger and others in Roger Hanlon’s lab raised the possibility that cephalopods can see with their skin. 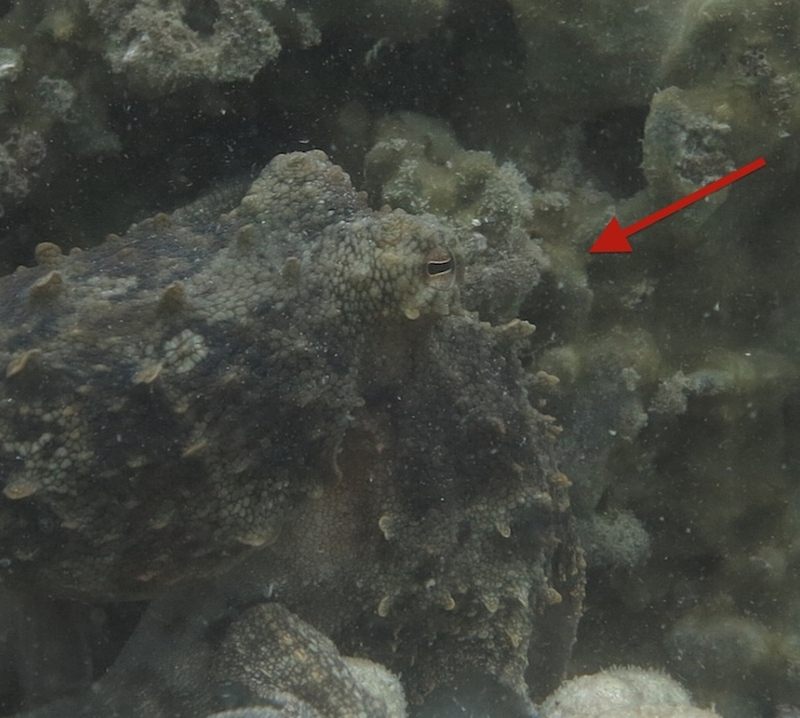 This paper was based on a genetic finding: a gene for a cuttlefish’s photoreceptor protein was found to be expressed in the animal’s skin, as well as its eyes. If cephalopods were sensing light with their skin, this would not immediately solve the color-match problem, as they still have only one photoreceptor. But might it be part of the answer? Mäthger and co. made some cautious suggestions on this point, which I’ll come back to in a moment. I wrote about the sensing of light with skin and the color-match problem a few years ago on my old website, here. Back then I found just one person through the internet, Desmond Ramirez, a graduate student, who confirmed that he was following up the question of skin-based seeing in the lab. All this was back in 2013. In my book review last month I pressed on the issue a bit: isn’t there something important to think about here? How might all this relate to color perception? Mäthger and co. offered some possibilities in their 2010 paper. For example, they noted that the eyes of some other animals, such as turtles, contain oil droplets which act as filters, determining which wavelengths of light reach the retina. Similarly, a light-sensitive cell in a cephalopod’s skin might be closely associated with a chromatophore that acted as a colored filter. That combination of chromatophore-plus-photoreceptor would respond to colored light differently from a combination in which the same kind of photoreceptor was paired with a different colored chromatophore. When I wrote about this before, Lou Jost, in a comment on the website, also made a suggestion along these lines. His is slightly different from the one Mäthger and her co-authors raised. Jost suggested that light-sensitive cells might sit in a position below the chromatophore layer. As chromatophores of different colors expanded and contracted above, the light passing through to them would be affected in different ways. If expanding a red chromatophore affects the incoming light less than expanding a yellow one does, then the light contains more red. If the animal kept track of which chromatophores were expanded, as well as how much light was reaching its sensors, it could know something about the color of incoming light.† The animal would be exchanging one filter for another as it went through its chromatophore-based color changes. In the same issue of the journal in which Ramirez and Oakley’s paper appeared, Alexandra Kingston and others in the Hanlon lab published another paper on light-sensing in cephalopod skin. Their paper is about the physiology, and does not show actual sensitivity, as Ramirez and Oakley do. Neither paper discusses the idea of chromatophores as color filters, raised in the old Mäthger paper and by Jost. These ideas surely now seem promising, though. They do rely on assumptions about the placement of chromatophores and light-sensitive cells. The Kingston paper suggests that photoreceptor molecules are associated especially with the chromatophores themselves. The Jost proposal also needs something like an “efferent copy” mechanism: as the animal sends a command to expand a chromatophore, it would send a signal to the sensory side – or do something equivalent – in order to know which of its filters were affecting what it saw. But in some ways it would be surprising now if something like one of these mechanisms was not operating. As long as some light-sensitive structures lie below the colored part of the chromatophores, when the animal performs its chromatophore changes there will inevitably be effects on what it senses, and these effects will correlate with the color of incoming light. The information is available. It seems not a difficult evolutionary transition for the animal to put this information to use. 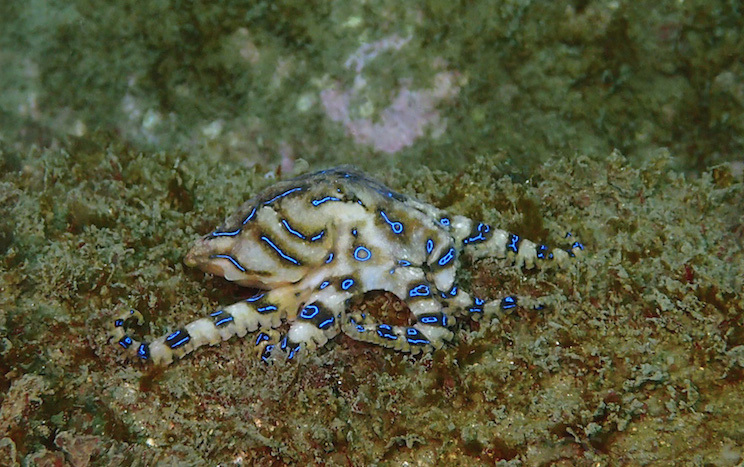 Speaking of color, yesterday I saw, for the first time while diving, a blue-lined octopus, Hapalochlaena fasciata. It was roaming round the sponge garden at Fairlight. These are unnerving animals, figuratively as well as literally. I’ve gotten used to the good-natured appearance of Octopus tetricus, the species in the other photos in this post. I think I’d have found the blue-lined octopus disturbing even if I didn’t know it could kill me in minutes with one bite. It moved in a tense way, with a few arms held out, and shifted between partial camouflage and vivid blue warnings. Their bite contains tetrodotoxin, which blocks the sodium channels by which nerve cells fire. 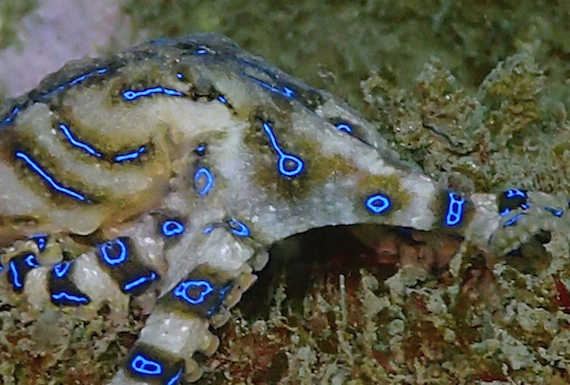 How do these octopuses flash their intense blue rings and stripes? The rings contain physiologically inert multilayer reflectors, arranged to reflect blue–green light in a broad viewing direction. 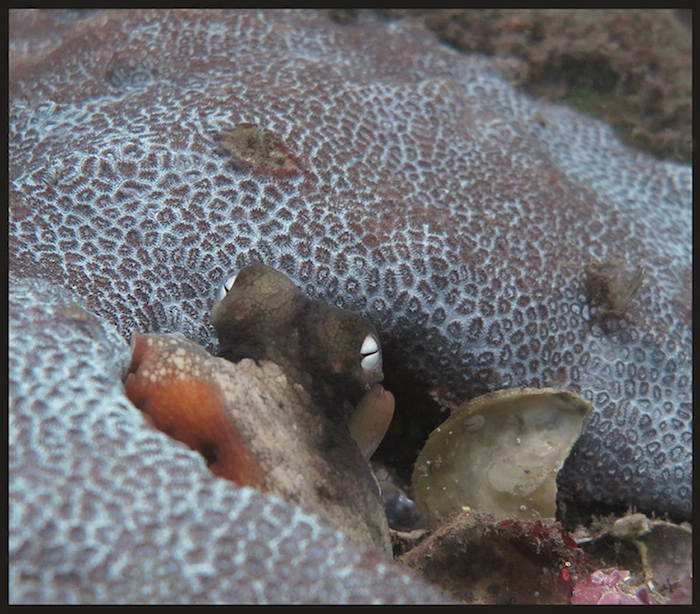 Dark pigmented chromatophores are found beneath and around each ring to enhance contrast…. The ring is hidden by contraction of muscles above the iridophores; relaxation of these muscles and contraction of muscles outside the ring expose the iridescence. * If you don’t have access to the journal and want to see the review, send me an email. † The Ramirez paper took a fair while to make it through the publication process. The journal’s note about dates says they submitted it in July of 2014. 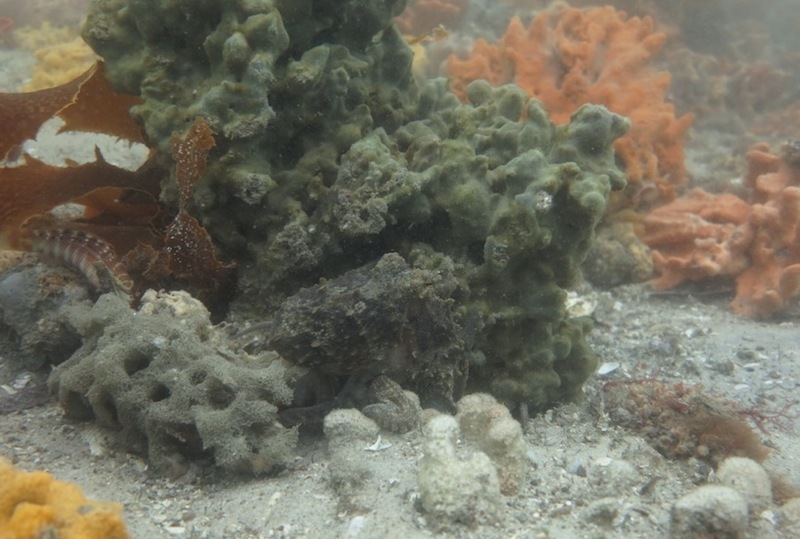 ** This octopus (tetricus again), at Nelson Bay, has achieved an especially good color match here. ‡ When I replied on my website to Jost’s suggestion back in 2013, I didn’t notice the similarity between his idea and one of the suggestions in the Mäthger paper, described above. I’ve also modified the details of Jost’s proposal slightly above. This entry was posted in Cephalopods, Color, Octopus. Bookmark the permalink. That’s an interesting case of convergent evolution, on both fronts (color and mechanism). Great butterfly, too.